Bottom line: it's working! 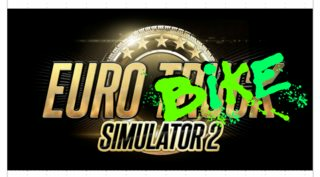 I have been riding my MTB around ETS2-land for weeks now, have put several thousand km (virtual) on the bike, and it's a blast This is the prototype version of course, and there are several annoying issues I'd like to resolve/improve; but it's the most interesting and fun exercise bike / trainer I've ever ridden whether you're sweating your way over the Pyrenees or rolling along easily on the flatlands, the illusion is reasonably convincing. I get bored after 10 minutes on an exercise bike, but I can easily go EBS-ing for an hour or more every evening. Note to devs: now you know why I'm so appreciative of those scenic, winding, two-lane country roads! I have been editing all this doco for days and would welcome reader comments: typos, unanswered questions, unclear points, etc. Bring on the questions! That's a great idea. That might get me some motivation to do more sports, too. That is truly impressive! Well done!